These days we spend so much time online, don't we? So it's of course only natural that just like when we spend a lot of time in our homes and then occasionally need to have a big declutter, that that would be the case for our digital space too. Our productivity levels increase when we work at a desk which is kept clear, tidy and minimal. It helps us to focus and I believe that this exact same thing applies to the digital space we work with too, which is why I am digitally decluttering (and feeling so much better for doing so!). Below I thought I would share some of the ways that I am keeping my online/digital space as clear as possible to help me stay focused, help me to be more productive and stop me from being drawn in by unhelpful noise. Keeping my desktop clear. Deleting icons that don't need to live on the desktop. Not automatically saving to the desktop. Only having important documents I use daily on there within one folder. Unsubscribing from email lists I don't need to be on. (This option is generally found at the bottom of individual emails and it feels SO good to unsubscribe). Having notifications come up for junk emails or irrelevant emails is distracting and fills my inbox meaning it's less easy to access emails of importance. Cleaning up 'friends' lists - if I haven't spoken to somebody for years then there really is no need to have them on my online social media feeds unless I plan to get back in touch with them. Removing apps I no longer use from my phone. Organising other apps I do use into folders on the second page and keeping the first page of my phone as clear as possible with only my most used apps. Spending 5 minutes a day going through my camera roll on my phone which is currently home to over 17,430 photos(!!!) deleting duplicates, blurry images and ones I don't need to keep on there. Doing this task in 5-minute chunks is so much more manageable and realistic in terms of getting this HUGE number down. Spending 5 minutes a day cutting my 'following' number down on Instagram to make sure my feed is filled with only things that are positive to my life and that inspire me and that I am seeing posts from the people I actually want to see posts from. 'Unliking' pages on Facebook that are no longer relevant to me or that my interests have changed from. Turning off notifications for all social media (this is something I've always done) as I can respond to things when I am available to be online. Use email templates (again something I've always done) to send canned responses to enquiries or for things that I type out often that could take time. Deleting emails that I don't need to keep. Keeping my inbox as clear as possible and flagging emails that I need to do something for (such as collaborations). Marking emails that need a response as 'unread' so that I don't forget to reply. Spending a few minutes each day going through my 'Pictures' and 'Documents' folders on my iMac and deleting items I no longer need and making organised folders for things I do want to keep. Doing the same for my downloads folder. Making sure that I only have shortcut application icons on the bottom of my iMac screen that I actually use often. When working, keeping just the one tab I'm working on open and shutting down others or minimising them so that my screen doesn't appear too cluttered. Using the calendar app as a diary to keep track of any important dates or events I need to remember. Using the reminders tool to alert me of them. Also using reminders to keep track of things I need to do. So far I have lists for 'Goals', which I keep at the top of the list to motivate me. I also have 'Blog ideas', 'Youtube Ideas', 'Blog / YT work to do', 'Weekly meal plan', 'Things we need on the shopping' (which is a shared list with my Husband so we can both add to it). And I have things like, 'Meal ideas' and 'Family reminders'. I can create alerts for all of these if I wish to and I find it a great way to get it all out of my mind and neatly organised digitally so I can access the lists anytime and anywhere on my phone. Deleting Internet bookmarks I no longer visit. Keeping a good desktop background - either something that makes me smile, motivates me or something quite simple, relaxed and minimal. I currently have a photo that I took of my boys and my Husband in Disneyland Paris which motivates me as they are my three favourite people in a place that we have such happy memories in. 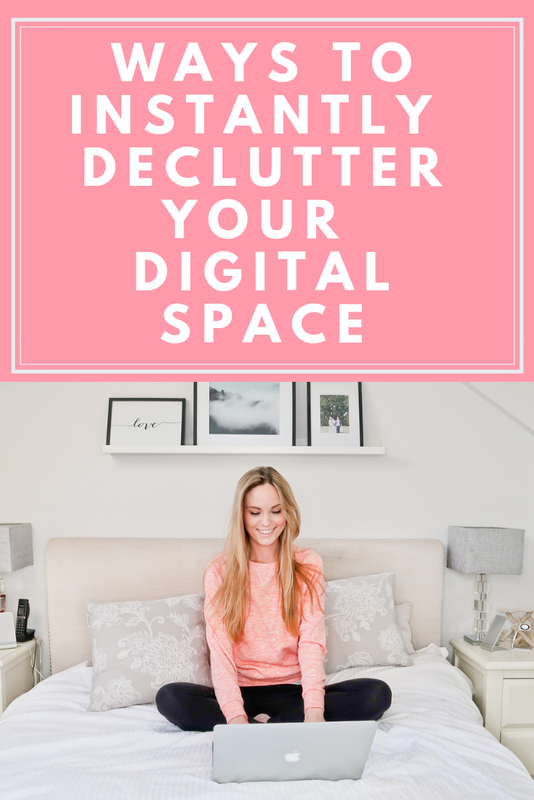 I hope this list was helpful to you if you're thinking of also having a digital declutter. If you know if any other ways to digital declutter that help you then please do share them with me in the comment section down below, I'd love to hear your ideas!